Standing in front of a boarded-up window, Dorrie Smith addressed a small crowd gathered on the sidewalk. A business district, she explained, is a representation of the community that it’s in. 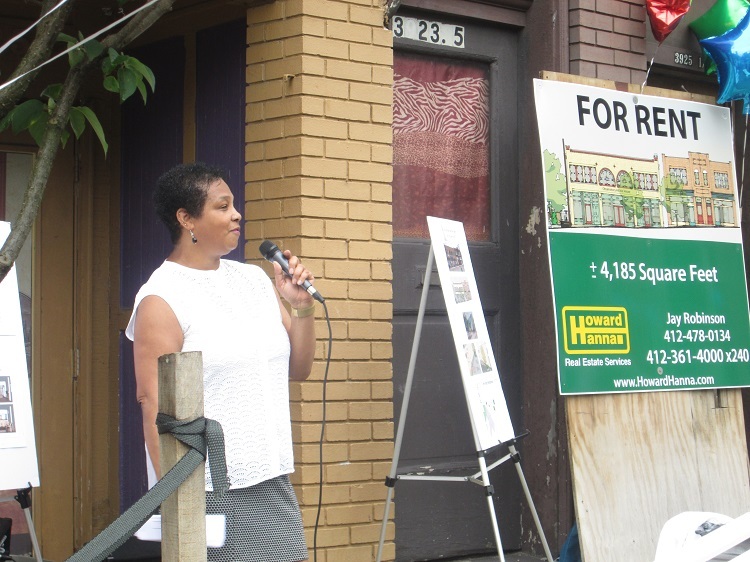 Dorrie Smith, president of the non-profit Observatory Hill Development Corporation (OHDC). “These buildings are not a representation of Observatory Hill,” said Smith, president of Observatory Hill Development Corporation (OHDC). Located in the North Side neighborhood’s business district at the corners of Perrysville Avenue, Bayview Street, East Street and Mairdale Avenue, the historic Five Points property will undergo a $1.7 million renovation as part of an ongoing redevelopment effort. Community leaders held a press conference and ceremonial wielding of paint brushes on May 31 to kick off the project, which includes the renovation of a long-time nuisance bar (formerly Mr. Bill’s) and two adjoining properties with first floor retail and restaurant space, plus second-floor apartments totaling 11,794 square feet. Potential commercial tenants already are eyeing the prime spots as work begins this month on the exterior facades, designed by Vince Finizio of VAF Architecture. P2 Contracting LLC is the contractor. Interior upgrades are scheduled to start in the fall and be completed by next spring. The location is potentially ideal for many businesses: In addition to having ample parking, the buildings are on a major commuter route. 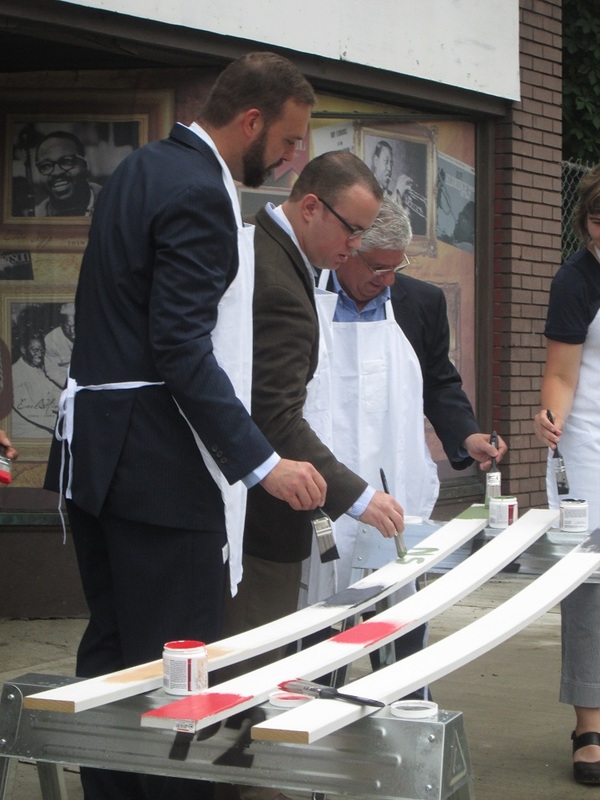 Jason Wrona, who serves on the OHDC’s board of directors, State Rep. Adam Ravenstahl and State Senator Wayne Fontana ceremonially paint trim. In 2015, the board acquired the building, along with 10 houses on Bonvue Street (five of which were sold at asking price). The organization also helped preserve Perry High School and the firehouse and constructed a new state-of-the-art soccer field, all within a quarter-mile of the Five Points project. The Observatory Hill revitalization project has financial backing from the Urban Redevelopment Authority, SSB Bank, Northside Community Development Fund and Rivers Casino, with management provided by the Northside Leadership Conference. State Representative Adam Ravenstahl, who grew up in Observatory Hill, said he will continue to lobby Harrisburg to fill gaps in funding. “The North Side does development from the bottom up. The community decides and promotes what the key is, what the strategy is,” said Mark Fatla, executive director of the Northside Leadership Conference. The post North Side’s Observatory Hill begins $1.7 million renovation of Five Points business district appeared first on NEXTpittsburgh.